A Rocket Battle Droid is a variation of a Battle Droid that is used in space combat. They come equipped with a jetpack. Rocket Battle Droids are very similar is design to ordinary Battle Droids. The only major difference is colour. 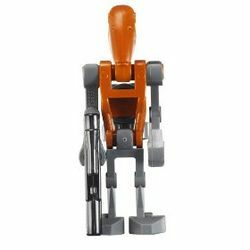 Rocket Battle Droids' heads and torsos are Dark Orange, and their legs and arms Dark Stone Grey. They also have a jetpack. Rocket Battle Droids were mainly used to find and destroy escape pods and battle Clone Troopers in space. Some of these droids were used to kill clones after Plo Koon's Republic cruiser was destroyed. Facts about "Rocket Battle Droid"
This page was last edited on 14 March 2016, at 21:22.